“I remember, I asked one guy to make Bubble Up and he said, ‘Why do you want it? Nobody’s gonna buy it.’ I just told him ‘If I don’t have it on my shelf, you’re right, nobody is ever going to buy it.’” It sold well and continues to sell at Galco’s. What's the context? This. A guy has a small grocery store in LA that sells boutique sodas. Artisanal pop. Old brands, forgotten brands. If you peer at the picture you can make out some brands you might miss, like Nesbitt. 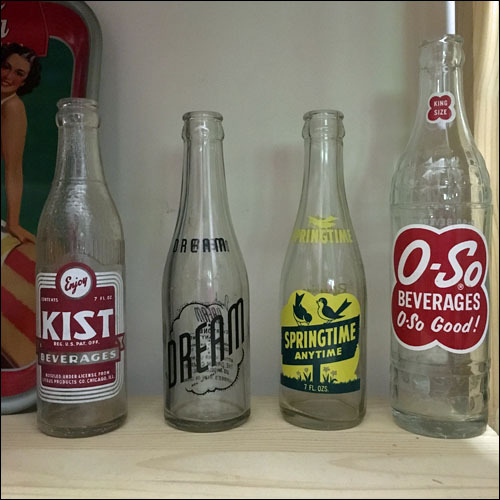 There used to be hundreds of brands in the US, as local bottlers came up with variations on the old favorites. (So many Seven-Up knock-offs. Or all things to copy, they had to give us another Lemon-Lime.) (Like Bubble-up, to be honest.) Antique stores still have some old bottles, and I've collected a few over the years. No idea what "Dream" tasted like. "How One Soda Shop Owner Took On Big Cola When Pepsi tried to stiff-arm this shop owner into buying it's overpriced sugar water, he decided to stock his shelves with something out of the ordinary." Some scary strong-arming there. Take that, Big Cola! Bonus: 25 discontinued drinks that should come back.